I’ve been picturing the devastation. The photographs started pouring in. Tahrir Square mobilized. Very moving. Qaddafi yet again made to look like a fool, which he isn’t. Just upsetting. Mohamed Bouazizi’s mother speaking out against tyranny. Even more moving and upsetting. And as a pessimist (who also studies the Middle East), I have few illusions that structural change in the ‘democratic’ direction will come to characterize the region as a whole. Ibn Khaldun, Wittfogel, and others have taught me that rulers (what we call dictators these days) have some advantages over the democratic process in nations where tribal affiliation still holds sway. Point is, I’ve been paying attention. But I’ve also been stuck here in my distanced analytical brain. Pictures, like music, bypass our rationality. They hit us in the gut. They hit us in the heart. All before we know that we’ve been hit. For this reason I prefer nice distant, rational photographs that remind us of perspective. 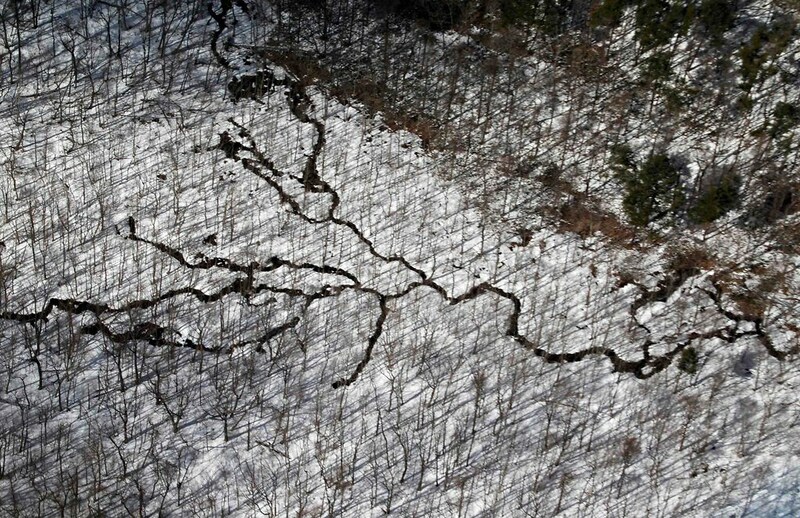 The one above, for example, from Sendai, Japan — shown in the New York Times. You don’t have to feel much at all, except the beauty of the planet giving a little stretch after a nap. Or stretch marks on a pregnant woman’s expanding belly, making room for a growing child. Beautiful. Yes I called it that. But then there are all the pictures of human devastation. Mountains of detritus of the products of man. Houses crashed over each other, splinters of urban life lying there in the photo, like ten million pieces of pick-up sticks waiting for the game to begin. Knowing we will pick up all those sticks, but we still won’t win. There are some amazing photos out there of the 8.9 earthquake in Japan. Shipwrecks among housing wrecks. Car wrecks out there in the ocean. Human faces crumbling or facing terrible loss. Photos that capture the shock of it all. And one of those photos got to me. Finally. It hit me hard. And I’ve been staring at these photos, glued to them, examining every corner of them, not looking for anything I can put my finger on. But this one, this one — and it’s not even a great cinematic photo. Just maybe a shapshot, really. But it hit me with tsunami force. It’s this little photo, with nothing much there to see. Two parents who’ve been searching for their daughter — and just found her. She’s barely visible, still in her car. Just a wisp of her hair, a quarter of her face. That’s all you see of her. And her parents are looking at her — not emoting for the camera. Her mother reaches out to touch her hair. 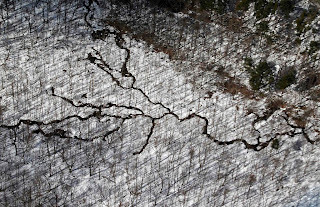 This is a private devastation, caught in a quiet landscape of post-earthquake and post-tsunami Japan. And it just broke me up. It got to me. I much prefer the stretch marks view of natural disaster. The aren’t-we-humans-stupid view of where we build our cities (not to mention our nuclear plants). But truth to tell, there are no safe places to hide from ‘mother’ nature. There are no corners of the globe that guarantee safe little lives free from a planetary yawn. Still, the view from afar — the these-things-are-natural — equanimity vastly contrasts with how we might feel about devastation of our own making. Middle Eastern wars, nuclear accidents, holocausts and inquisitions. We shake our heads or get engaged. We take sides. We get adamant. We can’t even blame global warming on this one. No one to blame really, but surely we’ll find a way. It’s so human to seek out culpability. So reassuring, somehow. Like maybe it’ll keep us safe and sound. No war here, we can say. Nothing to worry about. We live in a peaceful part of the globe. And I live in beautiful … San Francisco. What a safe haven from the political woes of the world. No earthquakes here, right? I mean, we’re not due for another ten years, easy. What great building codes we have, right? (“What big teeth, you have, grandmother” said Little Red Riding Hood to the wolf). We see what we want to see — until the truth slams us hard awake. Just like that couple staring into that twisted iron that used to be a car. Staring into a young girl’s face, a girl who used to be their daughter. Finding her that way. No, stuff like that — I just can’t take. Retreat. Retreat! As far back as I can. Can I make this not personal? I’m not sure that I can. But those parents just lost their child. How is that not personal? A kaddish for all those who mourn the devastation that surrounds them. A kaddish, one daughter at a time. This entry was posted in essays and tagged daughter, earthquake, japan, kaddish, tsunami. Bookmark the permalink. Gina Burns Thank you for saying what I have been holding inside my body for days. Mira Z. Amiras It’s strange how one small image can trigger the hurt of such a huge event.